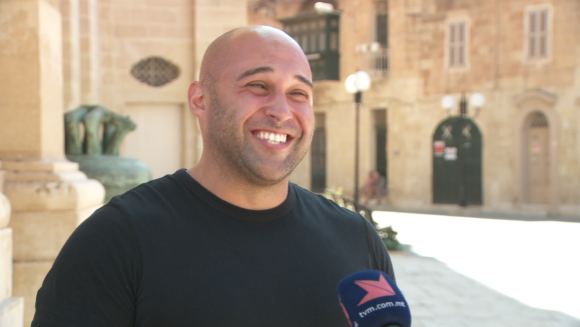 Maltese-Australian chef and entrepreneur Shane Delia is on a Malta visit to renew his family origins from Żejtun and to gain further details about the culture of Maltese food. Through the television series ‘Spice Journey’ Delia has become world-known and the episodes featuring Malta are being transmitted on TVM and TVM2. His last visit to Żejtun was eight years ago where his father was raised before emigrating to Australia. Delia said, “Żejtun is very special to me and not just because of my heritage because it makes some of the best pastizzi in Malta”. At that time he had filmed parts of ‘Spice Journey’ that was featured on SBS and Travel Channel and are now being transmitted by TVM. He said, “I remember sitting on these steps with my dad and my brother eating pastizzi that’s how it is”. Shane recently returned to Malta but this time he is not on an eating tour or researching further into pastizzi. He is here to appreciate his family while also gaining an insight into the distinct qualities of the Maltese kitchen. Shane said, “I think that the culinary identity has been lost through the ages even though there is amazing produce, amazing stories and some really passionate people that are really devoted to restoring Maltese culinary identity”. As an entrepreneur and owner of a number of catering outlets in Melbourne, where he employs over 150 people, needless to say he is also looking into business opportunities in Malta. “Since I’ve been here it’s been amazing I met some really brilliant people who have opened my eyes, if anything re-ignited my passion for Maltese food and presented me some good opportunities, and I’m hoping that in the next few months would be able to get a deal done here in the south which might start re-investigating and re-discovering what real Maltese food is about”, he stated. By producing ‘Spice Journey’, Shane dealt more with the aspects of food in the Middle East, Asia and the Mediterranean, a series that is transmitted throughout 130 countries. “What it did is it opened up predominantly the Australian market but the global market eyes to what food is and how important it is to the people from those cultures and than from the villages”, continued Shane. Throughout summer editions of ‘Spice Journey’ are being screened every Friday at 3.30pm on TVM and at 6pm on Sunday on TVM2.